Posted on August 6, 2013, in Drama and tagged Adventure, Boyle, Drama, Franco, Mara, Tamblyn. Bookmark the permalink. 27 Comments. Thanks a bunch! Couldn’t agree more. Although, I still think Sunshine might be my favourite Boyle film to date :). Definitely check it out again, always worth the re-watch. Oh my, everyone of his films have immaculate cinematography. Thanks again, will do! Thanks! Always nice to hear from ya :). Great review. One of my favorite movies (and Boyle’s best!) Was a sobbing wreck the first time I watched this. Thank you! I tried to keep myself together at the screening, didn’t want to look like a baby in front of them LOL. But yeah, just a tremendous film :). Excellent review, one of the great things I loved about the film was its loyalty to Ralston’s written account of it. I absolutely loved the book and this film nailed my experience with the book perfectly. Having that extra level of appreciation — and like you said, having seen the guy at the screening and knowing it was real — just makes the movie better. This was actually the movie that made me aware of Danny Boyle. Thanks Tom! Glad you love it as much as I do. I am a big fan of the book as well. I was so happy to see that they stayed true to the source material. What a great introduction to Boyle’s films. Hope you got to check out his other pieces of work :). i’ve definitely got some work to do. just recently saw Trance, which I thought was pretty good. but look forward to making my way through more of his for sure! Yeah, I really liked Trance. I’d recommend Sunshine and 28 Days Later. What I feel to be his best two, but honestly, all his flicks are amazing! oh jeez, yeah I forgot about 28 Days Later. have def seen that, loved it. Cheers to Danny Boyle! LOL, I kind of figured. Everyone’s seen that Boyle film! Great review, dude! 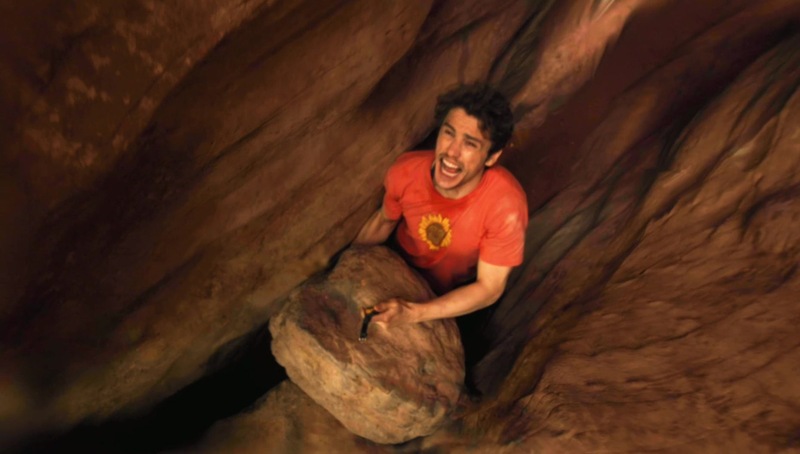 127 Hours is really incredible. The first time I saw it was at my local art theater. It was my first time there and it’s now my favorite theater in the city. The movie left such a strong impression on me that I read the book, watched the movie a few more times (including commentary) and sought out as many Rolston docs as I could find. I was just consumed by the story and fascinated by his will to survive. Franco left a really big impression on me too. 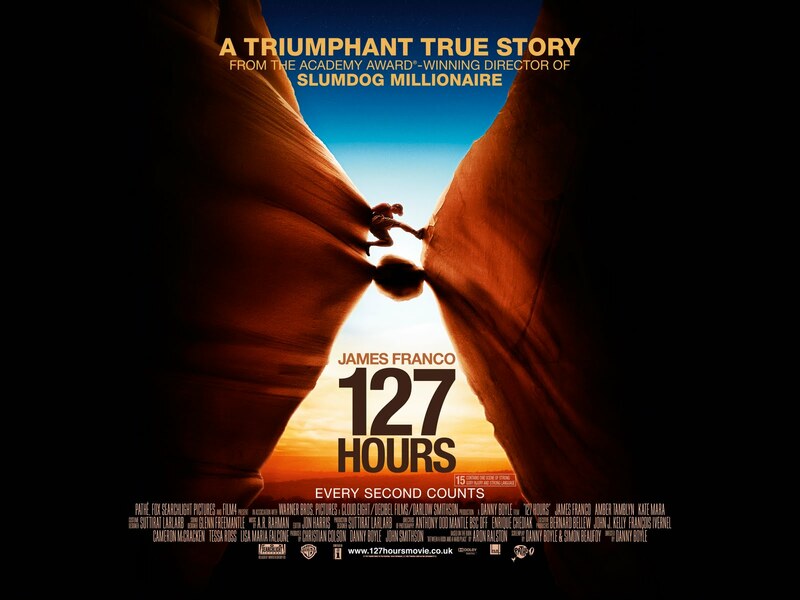 People like to rag on him and question his ability but 127 Hours earned him a free pass from me. The scene where he “hosts a morning show” is incredible. You mentioned the score and I do agree, it is really great. But the best use of music in the movie (in my opinion) is Sigur Ros’ Festival used at the end of the film. It just fits the emotion and power of the scene so perfectly. Thanks Matt so much! That’s awesome you got the chance to catch it at a local art theatre, makes the whole experience that much more memorable. I’m also a huge fan of the book and his story, so incredibly disheartening and motivating at the same time. I was always in love with Franco LOL. His performance here, I feel, should have won him that Oscar. The “talk-show host” scene was really unsettling. My favourite scene might be when he witnesses his future son, just f-ing epic. Completely agree, the ending composition really fit perfectly into the mood and circumstance :). Very nice review and a very nice rating. I really like this movie. It’s beautifully shot and I thought Franco was fantastic. I’m not always sold on his abilities but man he was good in this movie. Thanks Keith! I’m always caught off guard at how stunning the film actually is, it’s astounding. Yeah, I know Franco throws in a stinker now and then, but he has the ability, so I think that’s why I keep giving him the credit. Did you like his performance in Spring Breakers? Good review Joseph. It all comes down to Franco and his performance here which, above everything else, is nothing short of brilliant. Thanks! 100% agree, truly magnificent. Thank you Kim! 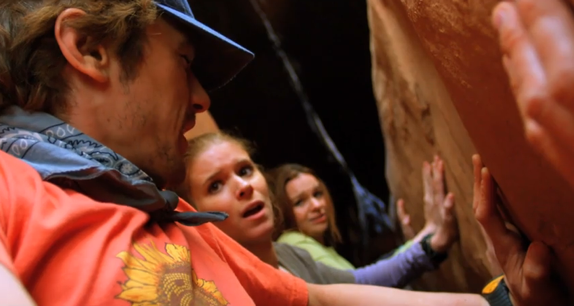 This movie is amazing and Franco is superlative :). I think I’m the only one that thought the film was over-rated. I didn’t like Franco in this at all. Nope, hated it. I was a little bored with the whole thing. What do you mean hated?! He is a genius lol. Never give up, he’s worth the effort.